The (ex)Expatriate's Kitchen: Applesauce Pancakes, Soft Eggs Over Polenta with Roasted Tomatoes. 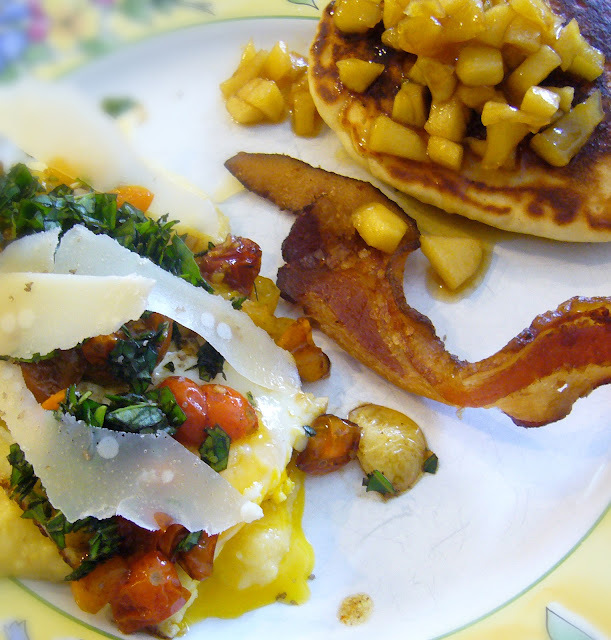 Applesauce Pancakes, Soft Eggs Over Polenta with Roasted Tomatoes. The mornings are getting crisp. I love sitting on the deck in a flannel shirt and sipping coffee. After a scorching drought all summer, it just feels good to be cool. It is both my favorite time of the year, and a bittersweet time as well. There are only a few Saturdays left at the farmers market. The very last of the tomatoes are a rare sight on the market tables, most of which had to be bench ripened since the days are not warming up enough to ripen the fruit on the vines. Apples and pumpkins have replaced the hot summer's one gift — the sweetest peaches I have ever eaten. But the crisp, tangy apples have their own appeal. Fall weekends are meant for a cup of coffee on the deck and a hearty breakfast before heading off to rake leaves or raid the pumpkin patch with the kids. Fall weekends are meant for a breakfast like this. I make batches of applesauce weekly. While it freezes well — try this Cranberry-Applesauce now and freeze for Thanksgiving — there's enough of it that I have to be "creative" to use it all. You can use whole wheat pastry flour here. 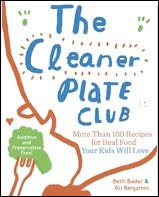 The pancakes won't be quite as fluffy, but will be a bit healthier. Stir the dry ingredients. Make a well, and blend in the applesauce through butter (wet) ingredients. Blend just until lumps are gone. This is a very thick batter and will make fluffy pancakes. It works great for waffles, too. Cook on a 350-degree griddle. Keep warm in the oven while you make the topping. Heat the butter and saute the apples until they soften. Add the maple syrup, cinnamon and salt. Simmer until the syrup thickens a bit. Drizzle over pancakes. The idea here is use more fruit and less syrup on your pancakes! Break up the polenta in a sauce pan. Add the stock and heat to a simmer. Stir, breaking up the polenta more until it is heated through. Use a stick blender (carefully!) and blend the polenta and stock until creamy, keeping it over a low heat. Finish with the salt, Parmesan and half and half. Keep warm. Preheat the oven to 375 degrees. Halve the tomatoes on a greased baking sheet. Toss them with the balsamic vinegar, oil and salt and pepper. Roast on top rack of oven, turning at least once, until they are caramelized but not burned. About 10-15 minutes. Remove from oven. Heat butter in skillet. Gently crack eggs so as not to break the yolks. Cook to desired doneness. We like ours a bit runny. But, we also know our chickens and the farm where they came from. To serve, add bacon, well a slice anyway, once in a while. For the eggs, 1/3 cup of polenta, place two soft eggs on top. Top with the roasted tomatoes. Garnish with basil and shavings of Parmesan. A bit of coarse sea salt make this sing, too. Don't forget the pancakes. And the coffee. The leaves can wait. Serves four with leftover pancakes you can freeze between wax paper and reheat in the toaster for a quick weekday breakfast.